Set in the heart of Epping Forest yet just 12 miles from the centre of London, Loughton has a secluded, self-contained quality, while also maintaining excellent transport links with the capital and surrounding countryside. If you need more information about us, try our wikipedia entry as well and you will get an excellent introduction to our town. Loughton has a population of 31,106 (2011 census), and an electorate of 24,687 (Dec 2017). The town is set in 3,750 acres in the south-west of the county of Essex, England, approximately 1,500 acres are forest, 600 acres are green-belt meadows and fields, and 1,600 acres the town, town open spaces, and private gardens. Loughton is situated 12 miles north-east of London, to which it is connected by the London Transport Central Line railway and by the M11 motorway. It is bordered by Buckhurst Hill and Chingford to the south, Waltham Abbey to the west, and Theydon Bois and Chigwell to the north-east, and is part of Epping Forest district. Loughton nowadays has 2 town centres, 3 secondary schools, 12 main places of worship and an industrial area to the east of the town. The main employers include the Bank of England Printing Works (where all English banknotes are made), and construction firms Higgins and the Kier Group. Retailing is a major activity with the new Epping Forest Shopping Park opening in Langston Road adding to the wide choice of shops in The Broadway and the High Road. Loughton is a good base for visiting London (daily inclusive travelcards giving unlimited travel in London after 9.30 a.m. are available), Essex, East Anglia and the northern Home Counties (through excellent road connections). Good walking and horse-riding in adjacent Epping Forest are popular leisure activities. To the south east of the town lies Roding Valley Meadows, the largest surviving area of traditionally managed river-valley habitat in Essex. It consists of wet and dry flower-rich unimproved hay meadows bounded by thick hedgerows, a small amount of scrub, secondary woodland and tree plantation. 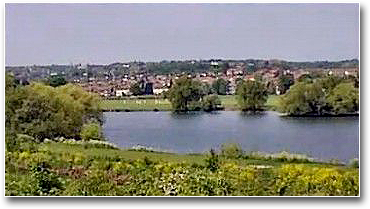 The reserve follows the River Roding for some 1.5 miles between Chigwell Lane and Roding Lane, Buckhurst Hill. The area is managed by the Essex Wildlife Trust. Loughton often features in the popular TV series The Only Way is Essex, a BAFTA award-winning semi-reality show. Two shops in the High Road are also directly connected with members of the cast.